Australia has its fair share of beautiful and expensive property, but then there are also some quirky homes scattered throughout the Great Southern Land. These atypical pieces of architecture are unique in their own right and cannot be confused with any other properties, no matter which way you look at them. Some are architectural marvels of note and others are peculiar works in progress, but one thing is certain: they’re all sure to have you questioning what a home is supposed to look like. Weighing approximately 50 tonnes, this rotating house is built in the shape of an octagon and has a diameter of 24 metres. 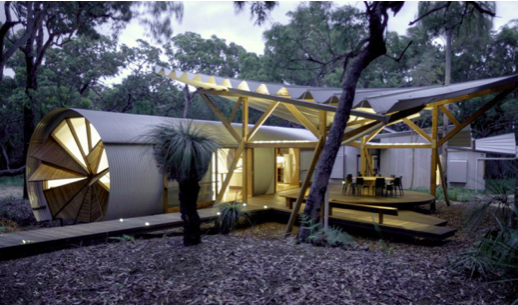 It is surrounded by a 3 metre-wide hardwood verandah and the entire structure has the ability to rotate a full 360 degrees. The Everingham Rotating House is the less-than-humble turning abode of couple, Luke and Deb Everingham. The centre of the house is its core, and it contains all the house’s inner workings, like the plumbing and electricity. 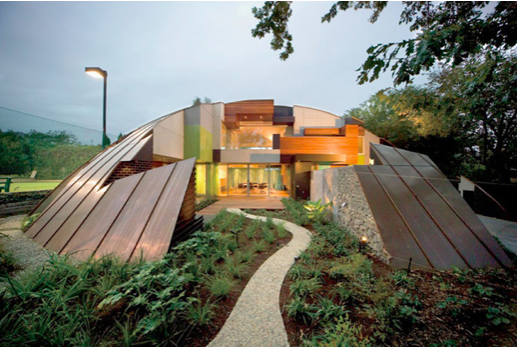 Shaped like an octagon, the Everingham Rotating House doesn’t have the hallways and rooms of traditional homes, but rather has a series of eight pie-shaped rooms that surround the core. Should they feel like it, Deb and Luke can rotate the house a full 360 degrees in about 45 minutes when it is rotating at top speed, so there is no chance of getting dizzy from the sheer speed. 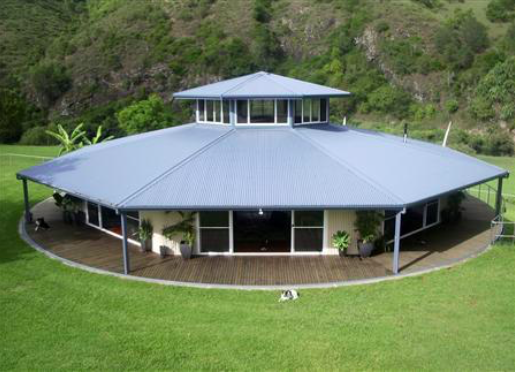 You can visit the Everingham Rotating House at 95 Longview Close, Caffreys Flat, New South Wales, and it is also available to rent as a holiday home (that sleeps 16 people) or for functions. Also known as The Pods, Drew House was created as a holiday retreat for Australian photographer Marian Drew and her brother, Derek, this house draws inspiration from her family’s history with sugar mills, and was designed to look like a luxury campsite of sorts. The house has been designed to blend seamlessly with the natural forest that surrounds it, and it is touted as a space that creates indoor and outdoor spaces that will allow visitors the maximum enjoyment of the mild sub-tropical climate and the bushland setting. In addition to fitting in with its surroundings, Drew House also sports an energy-efficient passive design, which includes rainwater tanks, solar panels and a community water recycling system. The house is largely self-sufficient. Drew House is located on the luxury eco estate Sunrise at 1770, just south of Agnes Water, and is available to rent for a weekend or holiday getaway. 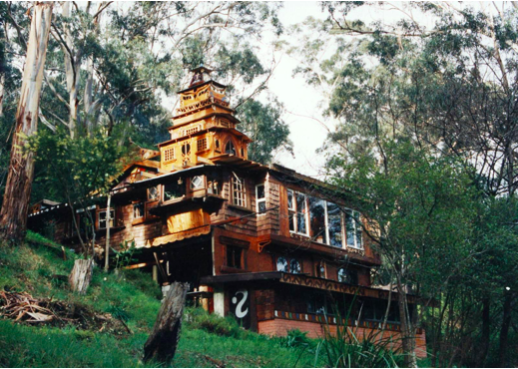 Built by the engineer and Outsider artist Robert Prudhoe (colloquially known as Boinga Bob), this treehouse draws inspiration from traditional Tibetan temples, nature and mathematics. There are many things that make Boinga Bob’s Treehouse Temple unique, among these the fact that the house – as elaborate and unusual as it is – is not held together by a single nail. This, together with other structural quirks lead to safety concerns from the Yarra Ranges Council, which serves Warburton in Western Australia, where the Treehouse Temple is located. Robert Prudhoe, who is in his late seventies, plans to leave the unusual house to the community as a legacy, provided that it is used for art, and not for development. A shaded backyard behind an existing house in Melbourne’s northern suburbs gave rise to this piece of interesting architecture. The property won the Residential Architecture Award at the Victorian Architecture Awards in 2012, and the north-facing home was converted for a family with small children. It was converted from what was originally a north-facing property with a two-storey extension from the 90s that obstructed sunlight considerably. When it was converted into its current state, the once-shady backyard became the centre of the house, and its design is reminiscent of the hilly Tasmanian landcape, which is where the owner is from. The unusual design was done by Austin Maynard architects and was completed in 2012. Built for interior designer Debbie Ryan’s mother, this house appears to sink into the landscape that surrounds it. Ryan and her husband Rob McBride, who is an architect, designed the home to tie in with Heather’s fondness for copper – a design element and colour that features prominently on the exterior of the house. The structure is dome-shaped and contains elements that make it look like a giant 3D puzzle. The shape of the house was inspired by the copper domes atop famous churches around the world, but also by a pixelated artwork by Salvador Dali, named “Abraham Lincoln”. Keeping her elderly mother’s future in mind, Debbie and Rob designed the property both practically and aesthetically, and envisions that Heather will live on the ground-level when she gets older. This part of the house features the master bedroom and main living area, while the top floor is more of an apartment that contains another living space, together with three bedrooms and two bathrooms. 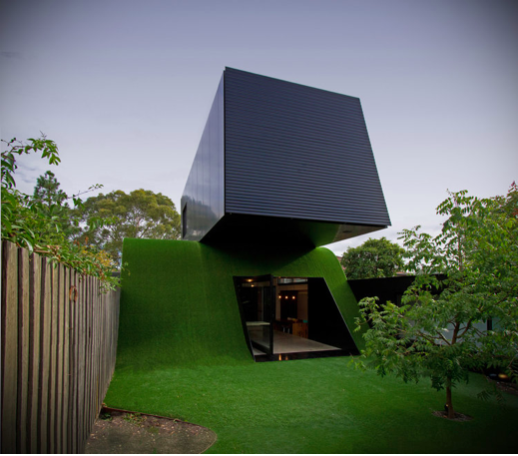 Dome House is located in the eastern suburbs of Melbourne. If you’re looking for residential property that stands out from the rest, you will definitely find it somewhere in Australia. However, if you want to sell you unique property and you are looking for an agent that can help to sell your property quickly, look no further than Perfect Agent. Simply fill out a questionnaire to help us understand your unique needs, and we will recommend a number of real estate agents to help you sell fast.